The F-3144 Series by Air Logic features its either nylon or polypropylene made small sized barbed elbows which are cost efficient. 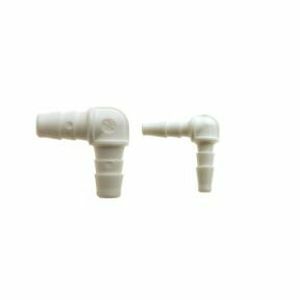 It comes with a maximum supply pressure of about 125 PSI and an operating temperature of -50°C to 82°C for nylon and -40°C to 93°C for polypropylene. Available colors for nylons are black and white while gray for polypropylene.